Kozo’s Mailbag: Who is Yotsuba? While not an Asian film-related question, it happens to be a very appropriate one, because I featured numerous pictures of Yotsuba in that earlier blog entry. Doing so was wrong of me, because I incorrectly assumed that anyone who dropped by this blog either A) knows who Yotsuba is, or B) won’t care one way or another. As this is Damn You, Kozo! and not something anyone would confuse with a quality blog, I figured I would be safe without the explanation. Well, I was wrong. 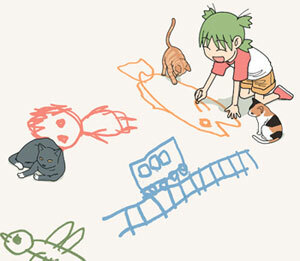 And even though a simple search can lead you to Yotsuba’s Wikipedia page, I thought I’d explain it here. Yotsuba is the name of a mischievous little girl created by Kiyohiko Azuma, the manga creator and all-around genius who also created a fun little gag manga called Azumanga Daioh. Yotsuba stars in the manga Yotsubato!, which basically translates as “Yotsuba &!”, with the ampersand connecting his main character to any number of things, including firecrackers, presents, global warming, flowers, and other things that may pop up in everyday life. What makes Yotsuba interesting and fun is simply her interaction with everyday things, and the surprising honesty, impetuousness, and rampant misunderstanding that a child may display when dealing with things like school projects, ice cream, strangers, the supermarket, next-door neighbors, and trips to the beach. Yotsuba also has a bizarre green hairdo that represents a four-leaf clover. In Japanese, “Yotusba” means four-leaf clover. There’s your language lesson for the day. The manga’s motto is “Enjoy Everything”, which explains it far better than I ever could. Both Yotsuba and the stars of Azumanga Daioh have made appearances on LoveHKFilm.com before, namely as featured images on the old Life with Kozo pages. I dumped them there because I enjoy both immensely; both share the same whimsical and frequently unexpected sense of humor, and both are free of fan service, violence, or any of the extreme subjects sometimes associated with Japanese manga and animation. Please remember, not everyone who likes Japanese animation is a pervert. I include myself in that category, though I have been referred to as a pervert on the Internet before. 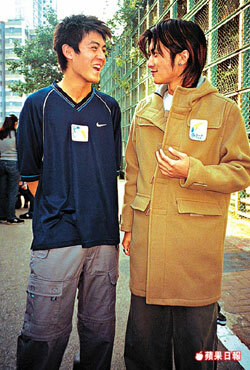 Fitting enough, it was a comment made on some Ekin Cheng forum somewhere. Anyway, Petra also asked where she can get her own Yotsuba action figure. 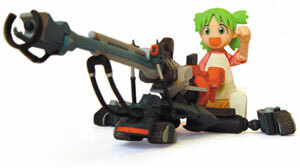 A Yotsuba Revoltech Action Figure can be purchased from YesAsia.com or any number of online retailers, though there’s not that much Yotsuba schwag currently available. 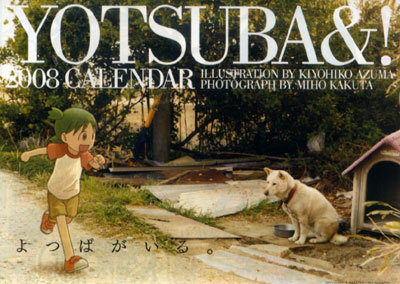 There is, however, a very nice calendar that combines photography with color illustrations of Yotsuba, placing Kiyohiko’s fictional mischief maker into a real-life context that perfectly summarizes her adventures and appeal. Yotsuba isn’t about wacky hijinks or over-the-top strangeness; it’s a simple manga that’s fun, familiar and even comforting, and there’s lots to enjoy in the character’s minor adventures. 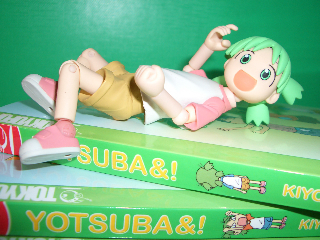 I said as much to Petra in my earlier email, and soon she got her own Yotsuba action figure, and even picked up a few issues of the manga. This picture proves that this blog can make a small difference. At the very least, it’s probably done more than the actual LoveHKFilm website has recently. 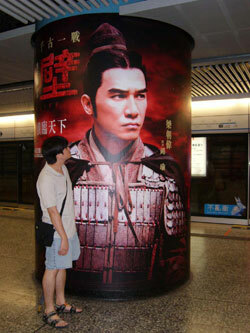 The next goal of Damn You, Kozo: persuading everyone that Hong Kong film is not dead. The first person I’ll try to convince is myself. 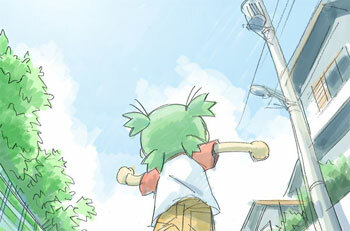 Anyway, I hope everyone who reads this becomes a fan of Yotsuba, too. My job requires me to do midyear evaluations for my staff, an always pleasant experience that I look forward to with unbridled enthusiasm and delight. Really, I’m totally telling the truth. Wow, that’s a dismal list, isn’t it? Some of the stuff that made this cut was not very good, but I had a hard time leaving them off in place of other films. There was no way that Missing, Linger, Kung Fu Dunk, or Fatal Move was making this list. They’re all more likely to make the “Worst 10″ list, though naming that right now would be useless because not much more than 20 films have been released thus far in 2008. That low number makes this the worst output from the territory since way before I was born. And I was born a while ago. This is usually where the expected “Hong Kong movies are really lousy” rant should occur, but I maintain that this is a numbers game that would be supported if Hong Kong produced more than 50 films a year. Back when Hong Kong made 300 or so movies per year, you could expect somewhere close to 60-100 good, or at least watchable films. Percentage-wise that’s not great, but apply that percentage to current times, and you get a little less than 20 good films per year - which is more or less accurate when applied to Hong Kong Cinema in 2005-2007. If my math is bad, I apologize. There’s also a whole other discussion here about what’s hurting Hong Kong film - i.e., lack of local support, targeting China, undue hype from the Internet, etc. - but I’ll leave that for another day. That is, if I ever talk about it at all. Some notes: Shamo and Beseiged City get included here because neither had wide theatrical release in 2007. Two films that would have made the cut are High Noon and The Way We Are, but both are thus far officially unreleased in cinemas so I’ll leave them out to see if they make the end-of-year cut. CJ7 misses the list not because it’s bad (it isn’t), but because the amount of disappointment that came with it is so disproportionally large that I couldn’t feel good about including it. Also, I didn’t consider The Sparkle in the Dark because I haven’t seen it yet. I’m guessing it’s not going to be Top 10 material anyway. If I remember, I’ll pass out final grades at the end of the year. Jay Chou was knocked unconscious by a flying basketball.